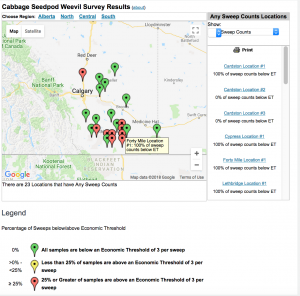 Alberta Agriculture’s cabbage seedpod weevil survey results for 2018 are mapped. In areas with a red marker, 25% or more of samples reported are above the threshold. 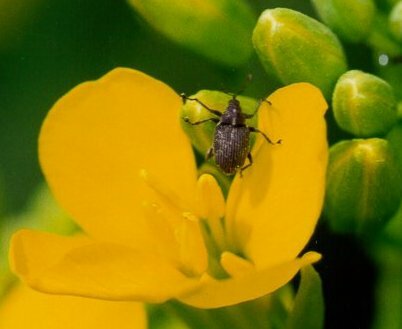 With earliest canola fields starting to flower in southern Alberta and southwest Saskatchewan, cabbage seedpod weevil scouting season begins. Here is the forecast map for 2018 based on 2017 surveys. 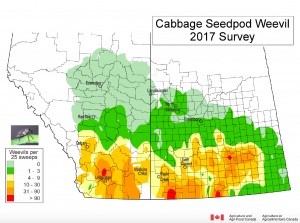 Earliest canola fields are just coming into flower in southern Alberta and southwest Saskatchewan, the highest-risk areas for cabbage seedpod weevil in Western Canada. Cabbage seedpod weevils tend to cluster in fields that are first to flower, so farmers with early fields will want to check them closely. 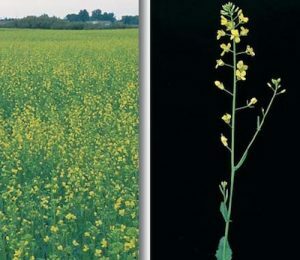 Use these descriptions to identify key flowering stages for sclerotinia stem rot and cabbage seedpod weevil management. 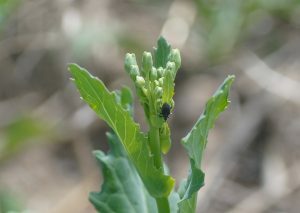 Cabbage seedpod weevils are attracted to the buds on early canola plants, as shown in this Brooke Moon photo. While they will feed on these buds and destroy some of them, spraying is rarely recommended before 10% bloom. Pea leaf weevils (bottom) can be found in canola but the only weevil of concern is the cabbage seedpod weevil (top). Thank you Shelley Barkley of AAF for the excellent photos. Grasshoppers may be above thresholds in some fields. The nominal threshold for grasshoppers in canola is 8-12 per square metre, although the higher end of that range may be more appropriate in a typical canola crop. 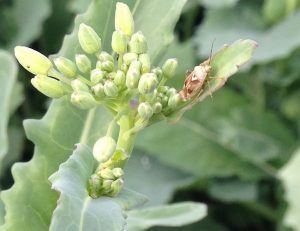 Grasshoppers are often at higher numbers at field margins, making a targeted spray possible. Scout to see where that line is. Sclerotinia stem rot and cabbage seedpod weevil control timing depends on flowering stage. This article will help you estimate 10%, 20% and 50% flower. 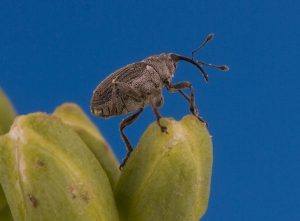 Cabbage seedpod weevils are one example of an insect where crop stage is a factor in the management decision. 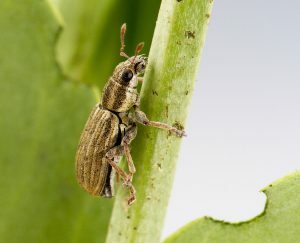 Weevils lay their eggs in developing pods, and these larvae feed on canola seeds inside the pods. The rule of thumb is pods less than 3/4” are too small for egg laying. If some plants are forming pods and the rest are still bolting, waiting will improve overall spray timing and return on investment.